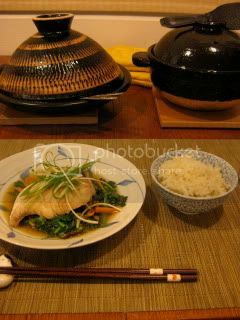 Here's my "DAY 3" sakana (fish) cooking with my tagine-style donabe, "Fukkura-san". I've been eating tons of salad every meal since I returned from France. 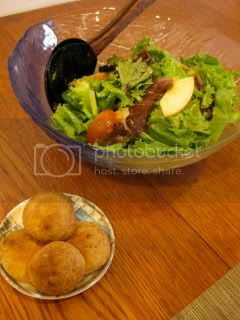 So, here it is, another salad shot, and I also made more gougeres again. After the salad, I made a quick Hamachi (yellowtail) Carpaccio. 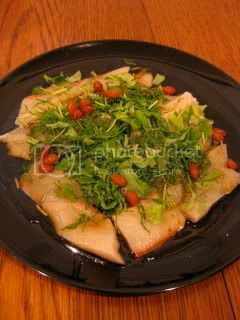 I sliced the fish very thin and drizzled the sauce (soy sauce, black vinegar, and sesame oil), and topped with sliced shiso leaves and goji berries. Very tasty. For the main course, it's also yellowtail, but the grown up kind, which we call, "Buri". It's another very quick creation. "Ankake" refers to slightly thickened sauce. 1. Season the yellowtail filets with salt and pepper. Dredge both sides of the fish with flour. 2. 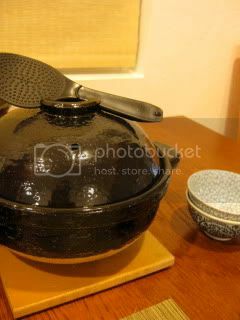 In a small pot, over medium-low heat, combine 1C chicken stock with 2T sake, 1/2 T nanpla (Thai fish sauce), 1/2 T soy sauce, and 1T mirin. Adjust the seasoning by adding a pinch of salt, if necessary. 3. In a small cup, stir together 1/2T of each kuzuko (arrowroot starch) and water. Stir in the mixture to the broth. Keep the broth over low heat. 4. 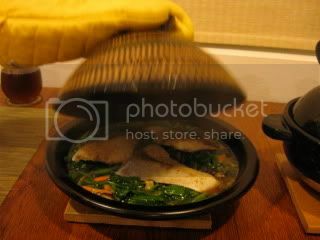 In the skillet of "Fukkura-san", heat the macadamia nut oil over medium-heat. Sear the fish filets for about 3 minutes. Turn them over and sear the other sides for another couple of minutes. 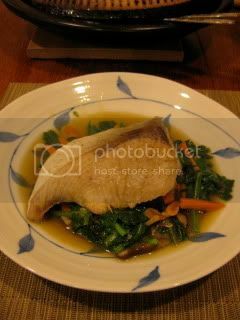 Transfer the fish filets into a plate and set aside. 5. Add some sesame oil to the skillet. Saute minced garlic, ginger, sliced shiitake mushrooms and carrot. Add the spinach (cut into 2" length) and continue to saute until spinach is wilted. 6. Add the sauce to the skillet, and lay the seared fish filets on top. 7. Cover with the lid and continue to cook for 2 more minutes. The dish was served right at the table. The aroma was gorgeous. And, of course, I made the donabe rice with "Kamado-san". It was another great "one-pot" fish main course with the rice!